The Mountain Chorus Frog is found in and around the Appalachian Mountains in the eastern United States. The frog starts breeding when they wake up from their hibernation generally around late February and early March. The males call sounds like reeking sound. Females can lay 300 to 1500 eggs in a clutch. No parental care has been reported in the Mountain Chorus Frog. The eggs hatch in 7-10 days and the tadpoles undergo metamorphosis in a month or two. The Mountain Chorus Frog is a terrestrial species of tree frog. They spend most of their time on the ground. The Coastal Plains Toad used to be part of the Gulf Coast Toad (Incilius valliceps) species but was split off due to genetic testing. It is still kinda confusing even though it happened over 20 years ago. The spring and summer rains bring the males out to start calling to attract females. They will breed in a variety of still-water sources such as ponds, wetlands, and roadside ditches. Females can lay up to 20,000 eggs in a clutch and have been observed to lay two clutches in extended breeding seasons. Neither the male or female show any parental care towards the eggs. The eggs will hatch in a day or two and the tadpoles will complete metamorphosis in 20 to 30 days. The Coastal Plains Toad has adapted alright to the urbanization of their habitat. They have been observed to hide under concrete slabs and in cracks and holes of sidewalks. The Western Toad is found in western North America, from Alaska down to Baja California. There are two subspecies of the toad, the California Toad (A. b. halophilus) and the Boreal Toad (A. b. boreas). The California Toad is found in California (duh), northern Baja California, and western Nevada. The Boreal Toad is found in the northern parts of the range. Some populations of the Western Toad are not doing so hot. Western Toads are listed in Colorado as an endangered species. They are listed as a protected species in Wyoming. Chytrid Fungus, a deadly pathogen, seems to be the main problem for the Western Toads. Habitat destruction is another problem for the toads. The Lowland Burrowing Tree Frog is not your typical tree frog, it doesn’t live in the trees, it lives in burrows. It lives in the desert so the they need to keep moist. The burrows they live in are very moist. If the moisture leaves during periods of drought, the Lowland Burrowing Tree Frog can create a cocoon out of their outer skin to help keep them moist. After the rains come and the frog doesn’t need the cocoon anymore, the frog will break out and then eat the cocoon. The Greater Siren (and all Sirens) is found in the Southeastern United States. It is the largest of all the sirens, with some reaching over 3 feet long. Just like all sirens, they lack hind legs but they still retain their gills into adulthood. Not much is known about the biology of the Greater Siren because of their secretive nature as they hide in burrows during the day and are slightly more active during the night. 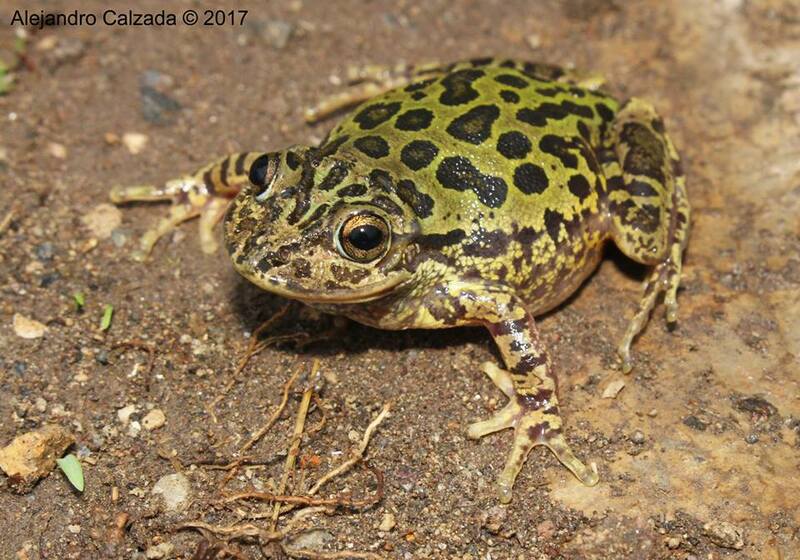 The Smoky Jungle Frog is one of the largest frogs in the world, with females reaching over 7 inches long while males are slightly smaller. The frogs have a long life span that can reach over 15 years. Mating takes place during the rainy months. Females form foam nests that the eggs are laid into to protect them from the environment. Not all eggs are fertilized, when the tadpoles emerge, they eat the unfertilized eggs. The super power of the Smoky Jungle Frog is its anti predator defense system where its able to secrete vast amounts of mucus when attacked. Besides the mucus being gross, it is also toxic so any predator won’t want to eat them. The goal of Herper of the Week is to highlight people from all walks of life who work with reptiles and amphibians and show their work to others. This month, all the Herpers of the Week will be women for Women’s History Month. This week’s Herper is Dr Amanda Zellmer, Assistant Professor of Biology at Occidental College. She leads the Occidental College Computational Biology Lab. Dr. Amanda Zellmer’s research focuses on the utility and development of computational methods for studying spatial ecological and evolutionary processes, particularly in the context of conservation biology. Her work usually deals with amphibians but has done research on other animals. She also is very interested in urban salamanders and showing that their is wildlife in LA. She earned her Bachelors of Science from the University of Wisconsin. She earned her Ph.D from the University of Michigan. The Siberian Salamander might be the most cold adept amphibian around. It can survive temperatures of -45 °Celsius or -49° Fahrenheit. With this ability, the Siberian Salamander is the only salamander found in the Arctic circle. It able to survive these conditions by replacing its blood with antifreeze chemicals. The Siberian Salamander can be frozen for years and be “revived” after it thaws out. The Zaire Dwarf Clawed Frog is part of the group of frogs referred to as the Dwarf Clawed Frogs in the pet trade. The Zaire Dwarf Clawed Frog is the most common species of the Dwarf Clawed Frogs in the pet trade. The Zaire Dwarf Clawed Frog is an aquatic species of frog. They only come up to the surface every few hours to take a breath. Like other members of the family Pipidae, the Zaire Dwarf Clawed Frog lacks teeth and a tongue.